Hailing from Melbourne Australia, the male / female duo of Amour Group (aka Luke Holland and Harriet Kate Morgan), were formed in 2012 and have been performing live on a semi-regular basis since. ‘Purge’ is their formal debut release, noting an earlier tape was issue in 2014 as a document of two performances from 2013 (reviewed here). Indecently ‘Purge’ was first issued on tape in a short run via Future Archaic in 2015, which has since been reissued on vinyl in collaboration between It Records and Trait Records. 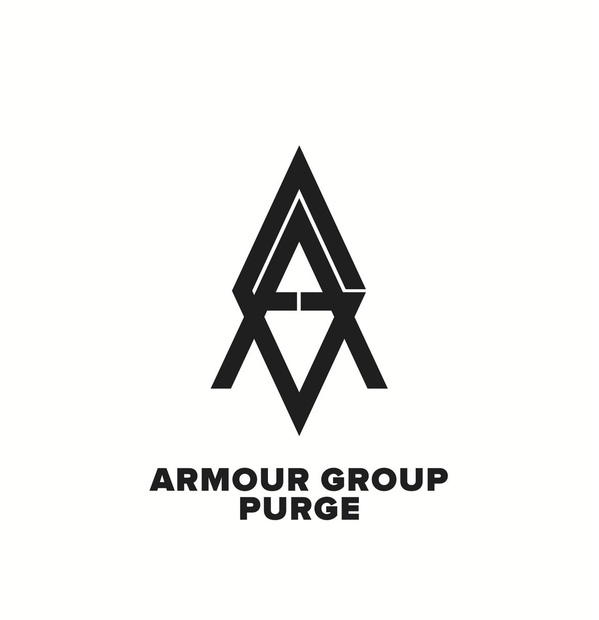 As for the musical focus, Armour Group encompass a somewhat direct influence from a ‘classic’ European power electronic and death industrial sound, but pleasingly this is done with complete sincerity to come off with both convincing and individualistic result. Sonically the sound is driven by a direct mid-paced analog synth structures, coupled with smatterings of dialogue samples and apathetic distortion processed vocals (care of both Harriet and Luke depending on the track). Having already previously heard “Purge’ in its initial cassette edition, the first thing to be noted on the LP pressing is the mastering treatment courtesy of James Plotkin. This is immediately evident on the sonic front as it has provided a boosted and forceful production. ‘Strength’ kicks things off with murky yet loud, revving analogue drones and semi-burred vocals. Encompassing a solid sustained tone and with minimalist variation over its length, this leads in the next ‘untitled’ track where idling machine like loops act a backing to a police interrogation sample. Yet it is on the third title track where things really take a step up in urgency, towards blood boiling ‘PE’ territory. Here the track ‘Purge’ features a focus atonal pounding rhythm, buzzing synth frequencies and an avalanches of distortion, where the human element comes from further interrogation samples and the gruff vocals of Luke. Another ‘untitled’ track opens Side B featuring a central militant drum beat and barren war scarred landscape, which leads into ‘Conditioning’ which is by far the longest track on offer at 9 minutes. Constructed around a stilted thumping beat and layered mid-toned pulsing distortion, Harriet takes the vocal lead with slightly echoed/ flanged apathetic spoken style (…over its course the layering becomes gradually fiercer as does the urgency of the vocal delivery). For the final album track ‘Shoot to Kill’ rounds out the LP on an absolute high. With an introductory sample of “The hunt is over. Shoot on site. Shoot to kill.” The track launches into spitting and static driven Korg loops and semi-buried but anger fueled vocals (…repeating in part the dialogue of a number of samples littered throughout the release). This final album track it is absolutely on point and a standout, which also justifies a positive comparison to the direct aggression of early Genocide Organ. All in all ‘Purge’ is not a long album by any stretch – totaling just under 30 minutes – but most importantly is not padded out with any filler material. With a predominance of subdued death industrial tracks, but augmented with a two direct power electronics assaults it is a very strong statement of intent as the formal debut, and clearly establishes Armour Group as a project which great things should be expected in years to come. Although at this point in time Armour Group may not be widely known internationally, surely with the calibre of the material featured on here this is set to change. Finally the sleeve design courtesy of Trine + Kim Design Studio is slick and understated to round out the visual presentation and with the Armour Group logo designed to resemble an explosive warhead, it is an apt metaphor of the sonics to be found within. This entry was posted in 2015, death industrial, industrial, It Records, power electronics, Trait Records by noisereceptor. Bookmark the permalink. So like where do you buy it and have you heard of John Murphy? Hi Alan. You can evidently get this LP from Polyester Records and also directly from both labels. As for John – yes I actually knew him a little (but only on a cursory level) when I was living in the UK from 2001-2005 and met him at numerous live shows. I also did an interview with him in 2002 where he talked extensively about his history and development as a musician. As the interview was only ever published online, I am re-printing it in the upcoming issue of noise receptor journal no.4 as a tribute to him.